If there’s one thing Nintendo Switch already has in abundance, it’s JRPGs. There are classics from yesteryear, Triple-A odysseys from some of the biggest developers in the word and a healthy smattering of independently-made offerings. As Switch owners, we’re spoiled for choice, so if you’re bringing a Japanese-style role-playing game to the platform in 2019 you really need to have something pretty special to help it breach the surface of that turn-based ocean. Unfortunately, Azure Saga: Pathfinder Deluxe Edition really doesn’t bring anything new to a crowded genre, but that doesn’t mean that this is a bad game or one worth avoiding due to a lack of quality. In fact, it’s quite a serviceable little title with plenty of things to like; it’s just the kind of game you’ll play, enjoy that almost instantly forget the moment you switch off your console. For some genres that might not be an issue, but JRPGs have often lived and died on their ability to stay with you long after the adventure ends. So while it’s unlikely to leave a lasting impression, Indonesian studio MassHive Media’s turn-based sci-fi romp still has bags of charisma amid its mobile-centric presentation. This is a studio that clearly adores Chrono Trigger, Final Fantasy and Secret of Mana, and it shows in everything from its enjoyable (if fittingly cheesy) story to the little tweaks to its tactical combat. You play as Synch, a young scientist who’s travelling the universe in search of the mythical planet of Azure. Turns out humanity is on its last legs, and this fabled world promises a fresh, resource-rich olive branch of survival. While there’s no voiceover, the story itself has plenty of offer with a decent cast of characters bobbing in and out of your classic JRPG party tropes – including armoured-up knight Kishar, bow-wielding rogue Sellaire and… well, you get the idea. You’ll travel to new planets, recruit fresh members to your squad and strategically clear out monsters on your way to tracking down Azure. And while its cutscenes have a real amateurish quality to them, the hand-drawn models and illustrations used when exploring its isometric overworld are bursting with character and almost seem part of a different game entirely. That isometric presentation has its pros and its cons. By dividing each area into a grid-like island, every location acquires a pleasing diorama aesthetic, but it also means your sense of exploration always feels very shallow. Some of the game’s strongest designs come in these truncated locations; it’s just a shame they’re a little too small to cast a full effect. It all adds to that semi-budget feel that permeates most of Azure Saga’s presentation. Even its soundtrack and audio feel a little on the cheap side. 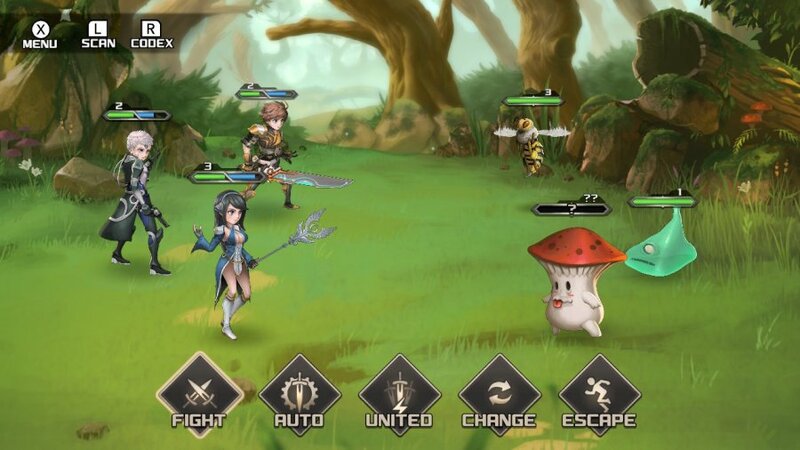 Thankfully, the one area that Azure Saga shines the most is in its battle system. Considering you’ll spend a good portion of your time in this mode, it’s good to see that MassHive Media has taken note of the key components that make turn-based battles so enjoyable and replicated many of them here with confidence. Rather than commanding each member to attack individually, the game enables you to assign your target and move (ranging from regular attacks to unique skills that damage enemies or buff/heal your party members) until all three characters are ready to attack simultaneously (in a fashion not too dissimilar to Chrono Trigger or Valkyrie Profile). Having them strike together isn’t for show, it also informs special group manoeuvres. 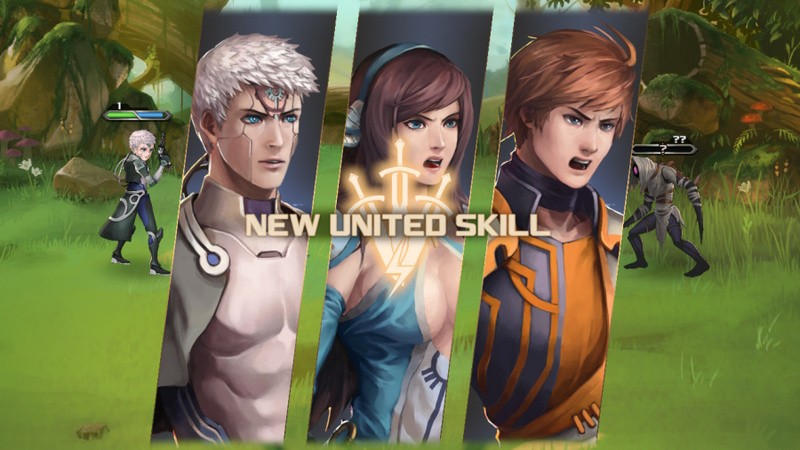 These United Skills differ depending on the characters you use and the choice of skills you select, so there’s a fun challenge to mixing and matching different squad setups to unlock new variants. These special moves are perfect for taking down larger foes quickly and limiting the amount of damage they’ll inflict. You can also scan enemies at any time during combat by pressing ‘L’. It’ll unveil some key stats about your foe, then reveal their health bar the next time you fight that species. Individually, you can also unleash more powerful Fury attacks, which work much like Limit Breaks from Final Fantasy VII. Much like everything else in Azure Saga, these attacks are over-familiar, but there are some helpful tweaks, including how these Fury attacks don’t override your normal attack so you still have a greater sense of choice in battle. 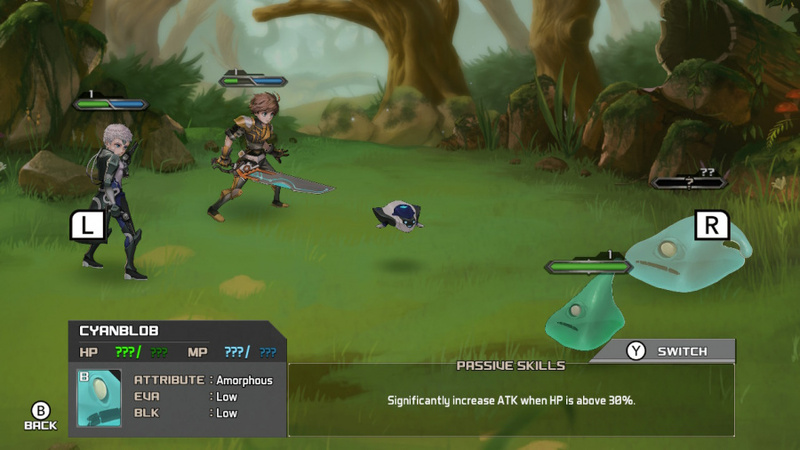 But for all those helpful tweaks – including the fact XP is shared across your entire party, including those who weren’t taken into combat scenarios – Azure Saga never innovates enough to overcome its own flaws. 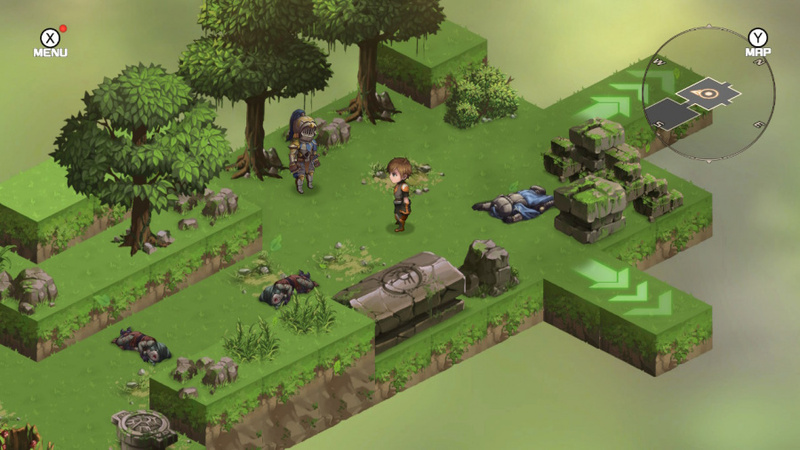 Its isometric overworlds are too often filled with scenery that blocks your view, or contain small environmental objects such as grass or flowers that serve as obstacles that have to be actively circumvented. The battle music is strong, with a wonderful Eastern quality to it, but the rest of the soundtrack is unremarkable at best. This is a game that desperately needs something unique about it to help offset the inconsistencies in its presentation and content. We don’t see many games coming out of the Indonesian development scene on Nintendo Switch, so it’s a shame Azure Saga: Pathfinder Deluxe Edition doesn’t bring anything new to a genre that’s packed to the rafters with familiar mechanics and only the occasional glimmer of innovation. It’s an enjoyable little JRPG with a serviceable battle system and enough genre tropes (including exploration, the occasional puzzle and the odd fishing mini-game) to at least satisfy veteran genre fans, but it’s an adventure in dire need of an ‘X factor’ to help it stand apart on the eShop.